The only downside is that everyone in my family loves this cereal also--from 2 yr olds to college age--which doesn't leave much for mom! I eat this cereal every day for lunch. I have a fairly large bowl with non fat milk, no added sugar, and it keeps me full all afternoon. I have lost almost 50 lbs, so I have to say this is a good choice for breakfast or lunch. It tastes better than any other cereal I have tried. This is one of my favorite breakfast cereals. I think what distinguishes it most is the quality of the freeze-dried fruit. When combined with milk, the fruit rehydrates quite well, tasting neither soggy nor chewy like so many others. I've tried the Honey Bunches of Oats version with Bananas, but it was way too sweet, almost disgustingly sweet. 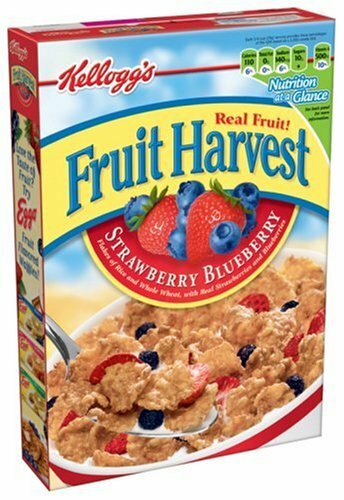 Fruit Harvest's version was simply the best. Light on sugar, full of crunchy bananas and tart berry taste!